Mazda today showcased the global unveiling of the Mazda MX-5 Miata 30th Anniversary Edition at the Chicago Auto Show. After 30 years and with more than 1 million sales, Mazda feels that the MX-5 belongs to the fans around the world that have supported the development of the model. To express its gratitude, and its high hopes for the future of the MX-5, Mazda developed Racing Orange, an exclusive body color that evokes the breaking dawn of an exciting new day. 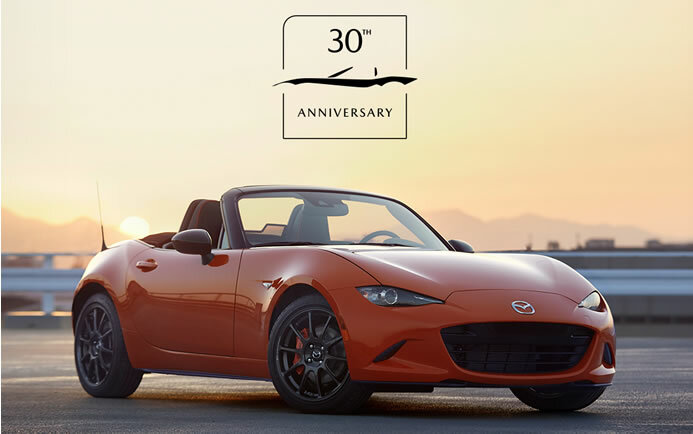 In addition to the exclusive body color, the Mazda MX-5 Miata 30th Anniversary Edition features forged aluminum wheels (Rays ZE40 RS30) developed exclusively for the MX-5 in cooperation with Rays and a 30th Anniversary badge that displays the model’s serial number. Sales will be limited to 3,000 units worldwide, including both soft-top and retractable hardtop models.